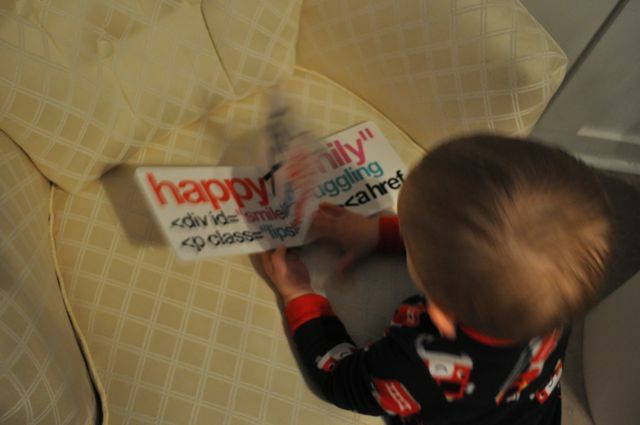 Six months ago I ordered the Code Babies book Web Design for Babies (Vol. 1) . I took a while for it to arrive as PayPal passed on an old address and I failed to catch it, but after a number of months both ends figured it out and then package arrived. 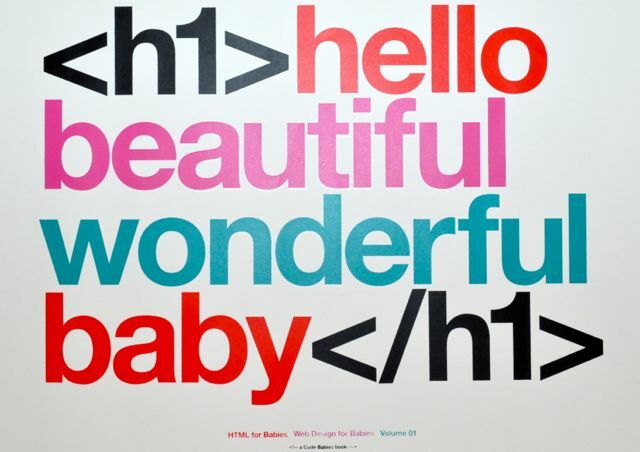 Code Babies were kind enough to include a poster (now in our second child’s room). The board book’s colours are bright and the content teaches children about SGML-based markup languages and their tag and property based structure, demonstrating the merits of extensibility. I consider my children a significant revision of their parents, and it’s my intent that as they encounter new experiences in life they demonstrate exciting innovation when possible and otherwise fail gracefully. I taught myself HTML when I was about 15, reusing a notebook that had been used for story writing from when I was about 8 for my notes. Why not give my children an earlier start, especially since they have 2 more versions of HTML and CSS to learn than I did? Since both our children were born with their own web site already up and running (first child’s site was standards compliant and dynamic, the upgrade for our second child brought a responsive, bootstrap-based, design) the sooner they can contribute to the World Wide Web the sooner they can start shaping the world they’ve found themselves in. Next lesson: POSIX-based file structures and how they relate to putting away their toys. If you use a Mac, and you haven’t had a chance to install it yet, I’d like to recommend AppleJack. AppleJack is a free open source tool that automates the basic UNIX tools are a few other basic maintenance tasks for OSX. 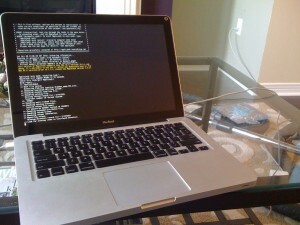 All things someone comfortable with the command line could do themselves, but AppleJack automates the process and more. 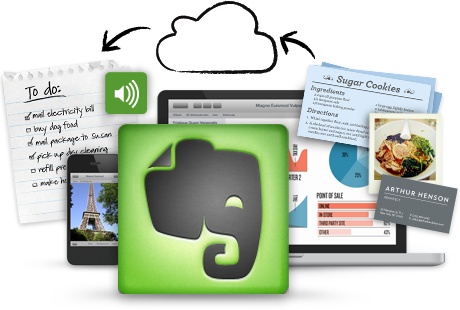 It’s routine repairs disk contents, repairs permissions, validate the system’s preference files, and gets rid of possibly corrupted cache files. 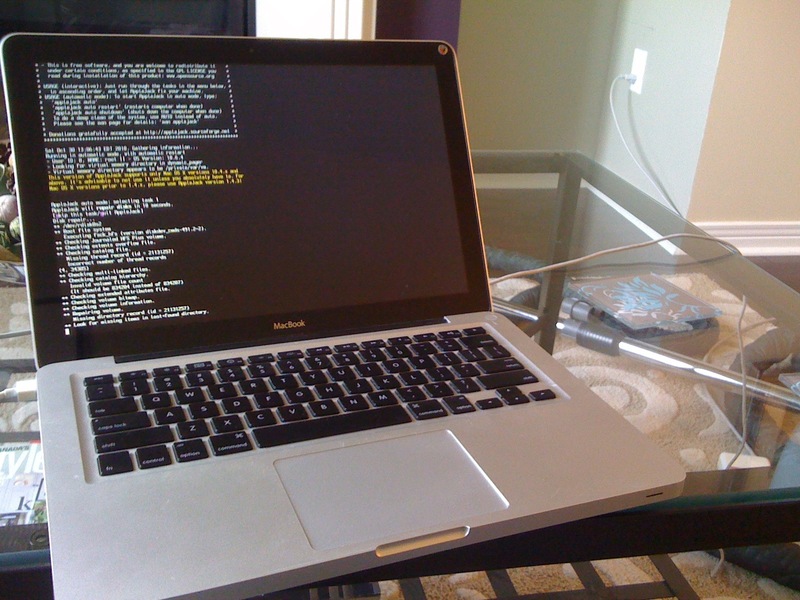 In my experience AppleJack is as good or better than commercial OSX maintenance tools and makes the most of the proven command line disk maintenance tools that come with almost all UNIX operating systems. 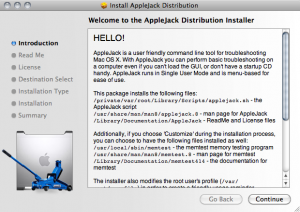 Once you have visited applejack.sourceforge.net and downloaded and installed AppleJack it is ready to be run. To run it restart in Single User Mode (SUM), by holding down Command + S keys at startup, and then when prompted type applejack, or applejack auto (which will run through all the tasks automatically), or applejack auto restart (which will also restart the computer automatically at the end of the process). One of my favourite features of AppleJack is that it lets you issue commands like applejack auto shutdown to have it run through its whole routine and shutdown the computer when it’s done. 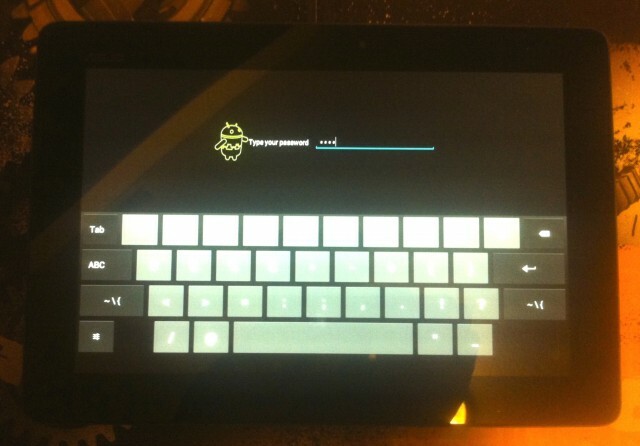 A great task to run at the end of the day, and it looks really hacker-cool when its running. I run AppleJack every once and a while, or when something goes wrong for un-explained reasons. Occasionally it catches problems and alerts me, but mostly I feel the benefits of good computer hygiene. You are currently browsing the archives for the *nix category.